Adventure. In Adventure mode you will start off with a fairly light team, and you’ll pick up more characters as you explore. This allows for more diversity in your party, and is ultimately easier. Fixed Party. In Fixed Party you will no longer locate and recruit new members as you go along. You’ll be stuck with the same two parties the whole way through, making the game a smidge harder. On top of these you also have Normal and Hard Mode, which make the game either normal, or… Hard? Self-explanatory. Regardless, if you’re new to RPGs you may want to start off with Adventure and Normal. (I’m also betting most players will want to stick with Adventure so they can gather all of the characters on their first trip through, but that’s up to you.) This walkthrough will proceed with Adventure, on Hard Mode. Important note! You get a different ending if you pursue the game on Hard Mode! You may want to start off in Normal if you're bad at RPGs, but to see the whole game you'll have to play it on Hard Mode eventually. I recommend just starting there if you have even the slightest bit of experience with RPGs. 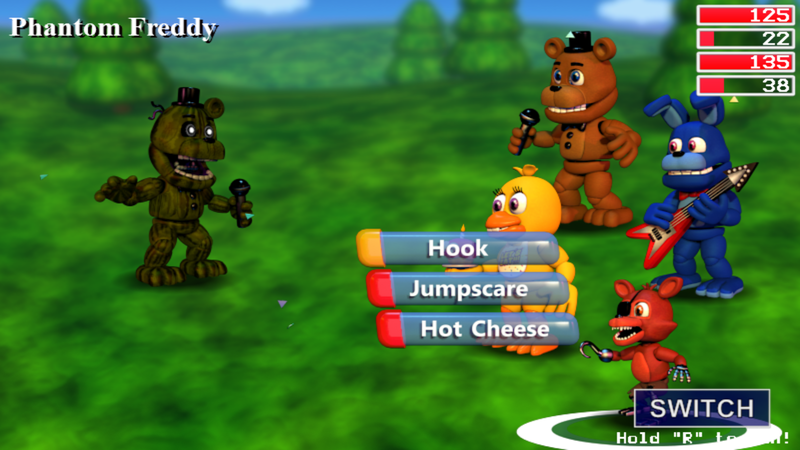 Regardless of the mode you choose you’ll then have to create two teams of animatronics to wander out into the madness of FNaF World. 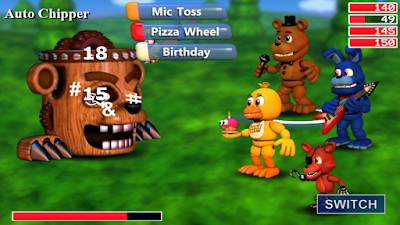 If you begin in Adventure mode you’ll have eight available animatronics to start (Freddy, Bonnie, Chica, Foxy, Toy Bonnie, Toy Chica, Toy Freddy, and Mangle); if you start with Fixed Party you’ll also get Balloon Boy, JJ, Phantom Freddy, Phantom Chica, Phantom BB, Phantom Foxy, Phantom Mangle, and Withered Bonnie to choose from. Mendo’s Endo Upgrades. Your standard equipment shop. You won’t be able to afford any of this just yet, and the higher-end stuff is way out of your price range at this point regardless. DeeDee’s Fishing Hole. For ten Tokens you can play a quick fishing game. The deeper the fish you catch, the more Tokens you earn. Grab the pearl at the bottom for 100 Tokens. Not the best way to make money, honestly, as the fish are preeeeetty dense, and getting the pearl in time is a crapshoot. Lolbit’s Byte Store. Here you can purchase one of a variety of buggy helpers. Each of them is a Byte. Bytes will appear in battle and help you fight off enemies. I highly recommend buying these little guys first. This particular vendor sells the Gnat, Neon Bee, and Neon Wasp. As you walk around you’ll also start getting into random encounters, like, immediately. Explanation time! 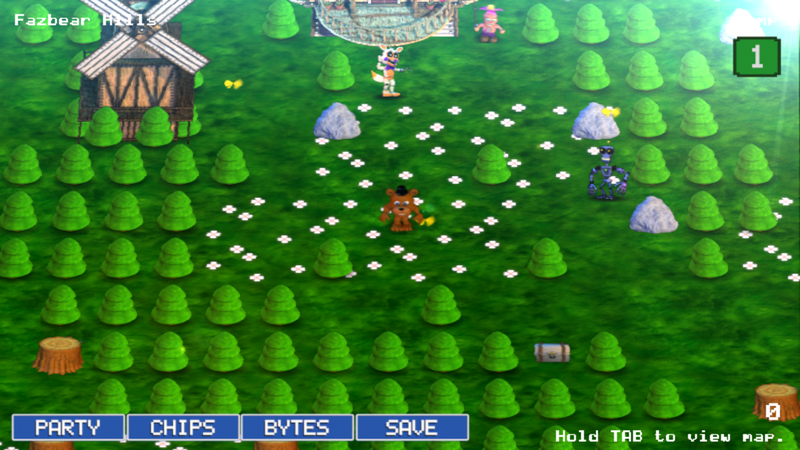 Phantom Freddy in FNaF World. There's a good chance this dude will be your first recruitable encounter. Orange moves hit a single enemy, either with damage or various status effects. Red moves will hit every enemy on the screen, also with damage or various status effects. White moves will provide your party with various status buffs. Black moves usually have a chance of instantly killing an enemy. Yellow moves (primarily Prize Ball, at this point) have random effects. You may get good luck, you may not. Spin the wheel! Green moves have a chance to poison one or more enemies, gradually reducing their health over time. Given how fast-paced this game is, you want to be veeeeery careful when getting hit by these, as many of the recruitable animatronics (particularly the Phantoms) like to use these moves. Purple moves apply debuffs to enemies, and may or may not cause damage at the same time. Defeating enemies will reset your health, so you don’t need to worry about carrying damage over between battles. As you gain experience your characters will gain levels and become more powerful, so it’s advantageous to meander around the starting area and fight a few times before setting out to explore. It’s important to note, too, that you have two parties at your disposal, and if one is on the edge of going down you should quickly switch to the second party to avoid terrible, terrible death. Save often. It will aid you in avoiding aggravation. Bouncepots. Probably the weakest enemies hereabouts. Quick red attacks will take them down quickly. Gearrats. Straightforward little strikers. They hit hard for the beginning of the game, and often appear in large packs up to four members strong. Stomp them with red attacks. Mechrabs. A little slower than Gearrats, but overall stronger. Same attack methods apply. 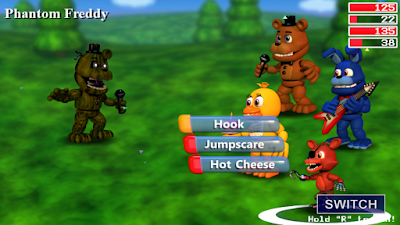 You may also start running into some familiar faces as you get into battles in Fazbear Heights. Yep, the animatronics are here, and they don't like you. Not at first, anyway. As you progress through FNaF World you will, occasionally get into miniboss battles against the animatronics of the Five Nights at Freddy's series. These guys range from extremely easy to pretty damned tough, and they show up with little warning - aside from a big, awesome message that pops up on the screen, of course. If you manage to defeat one of these animatronics they will join your party. Yay! There is not, as far as I can tell, any way to tell which animatronic will attack you, or when. They show up when they feel like showing up, and if you're forced to flee (or if you're just outright killed) you may not see the same animatronic again until a few areas later. That said, the animatronics tend to be helpfully staggered, so the chances of running into, say, Nightmare, one of the lowest animatronics on your list, are pretty low at the beginning of the game. Expect to see the likes of Balloon Boy, JJ, and perhaps some of the Phantom animatronics early in the game. - Okay! So! Now you’re ready to set out. The only other thing worth mentioning at this point are the treasure chests scattered around the world. They appear more or less at random after battles, as far as I can tell, and contain precious, precious Tokens. Grab ‘em when you see ‘em. - There are two directions you can go from the start; the other directions will send you into a different area, so head north. This will take you to a frightful dude previously mentioned. Auto Chipper, the first boss you'll meet in FNaF World. The first official boss! Honestly, if you’ve managed to take down either Phantom Freddy or Balloon Boy then Auto Chipper is no big deal. This hefty machine uses straightforward normal attacks to bash on your party members. It’s strong, but you can heal away the damage pretty easily, and Foxy can stun it to delay its attacks. Bring a few of the minor attack Bytes from town and they can do the majority of the damage while you sit back and defend yourself. Defeating Auto Chipper will allow you to access two chests. One contains the Headstart: Defense Chip, while the other contains the Headstart: Strength Chip. Chips are equippable items that apply evenly to all members of your party. You can only have four active at a time, but since you only have two, you might as well put 'em on now. - … to jump to a weeeeeird world. This little pathway leads to Choppy’s Woods. If you hold off on pressing the 'Done' button when Fredbear speaks to you, down the path to Choppy's Woods, he'll pixel up and provide some cryptic hints as to what's really going on. He'll then tell you to turn back and look for a 'clock'. 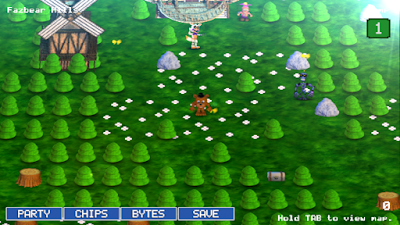 You'll find the clock just east of Fazbear Hills, on the edge of Choppy's Woods. Touching it will send you to a small minigame; complete it by pushing the silhouette of Balloon Boy into the box before time is up. So I'm worried about the save function. All the other functions open up a pop window, but the save button just flickers. Is my game saving? What happens if we dont do the clock stuff? they are for a secret ending, because (im not sure) fnaf world have 3 endings. one of them is the hard-mode, the another is the normal mode and the other is the clock tasks. Gearrats use Toxic Bite, which does good damage and poisons your team members.